Paratrooper owls? Flamethrower boars? How have I never heard of Tooth and Tail before now?! Take the political anthropomorphism of the classic novel Animal Farm, throw in some paratrooper owls, flamethrower-wielding boars, and mustard gas-flinging skunks, then turn it all into a real-time strategy game designed for gamepad controls, coming to PC and PS4. What would you call the resulting concoction (other than "amazing, please let me play it right now")? 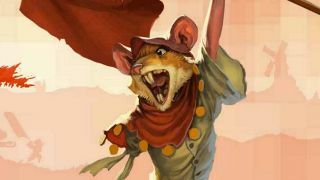 Well, the folks over at Pocketwatch Games call it Tooth and Tail, and as of this new trailer, it is my everything. I don't know how I managed to avoid hearing about this game until today, but I figure if I've missed out on it so far, then so have a few of you out there. And if you're anything like me, you're totally digging the eccentric designs, dark-yet-humorous tone, and wartime propaganda-inspired art style. September 12. Mark your calendars.